I almost feel like I have to. This morning as I left my client’s office in Anacostia and drove (yes, I know, Car-Free Day, blah blah blah) back to my roost in Fairlington, I felt the urge to try something new for lunch. I’d heard tell of the Weenie Beenie being home to one of the DC area’s best half-smokes, but I always wrote it off. That little place, across from the Day Labor center? How could that place be any good? It’s a walk-up, for cry-eye. Oh, how I was wrong. This statement is controversial, and I feel it may need more basis in evidence, but I have come away thinking that this might just be the best half-smoke in town. I almost feel like there needs to be a side-by-side taste-test with Ben’s to prove it, but I’m thinking that the Weenie Beenie may yet rule the roost. This entry was posted in: Food and Drink, The Daily Feed, WTF?! I’m down for the test. Now, where is this place at? The Weenie Beenie is in Shirlington, just off Shirlington Road, north of the 395 exit ramp. Wasn’t Weenie Beenie a chain or something in the ’60s? Seriously? Hell, I live right next to it then! I have dinner plans now! Woohooo! Yes- Weenie Beenie was a chain. And was remembered in song by the Foo Fighters. 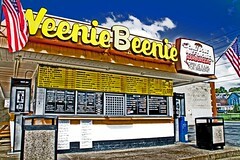 Weenie Beenie was started by Bill Stanton Mr. “Weenie Beenie” and a local pool shark. Rumor has it that it’s days are numbered as Arlington “rejuvenates” that section of 4 mile run. I sure hope not. I always meant to try their half smoke, but never got around to it before moving away. Possibly even more awesome, though: they offer a half smoke breakfast sandwich. Because what you need with your half smoke is eggs and cheese. I have to say it. Ben’s Chili Bowl is gross.